This article first appeared in the July 2015 edition of the Downeast Dog News. When this series started back in April, the intent was to alert pet owners that not all pet care services are pet-friendly and to emphasize the importance of making sure a pet has the most positive experience possible when it is boarding, day-caring, being groomed, training or while at the veterinarian. All of these animal care services can be done with a pet friendly approach; our pets deserve that. In this column I’ll be focusing on visits to the veterinarian and how many in the veterinary community are working to make those visits fear-free. Few people look forward to visiting the doctor or the dentist so we should not be surprised when our pets get anxious at the veterinarian. A healthcare usage study by Bayer Veterinary indicated that 37% of dog owners and 58% of cat owners said their pets hate going to the vet1. Going to the vet can be a frightening experience and fear is a powerful emotion. According to Dr. Marty Becker, “Fear is the worst thing a social species can experience and it causes permanent damage to the brain.” As a Certified Dog Behavior Consultant, I work with many dog owners and their dogs, often on fear related issues. It is a basic survival mechanism that allows fear to be locked into a memory in an instant and that trauma can be remembered for a lifetime. While these fears may be overcome, it can often take weeks, months, and even years of work to do so. Unfortunately, if we as pet owners and the pet care professionals handling our animals don’t recognize the signs and detrimental effects of stress and fear in our dogs and cats we cannot help them. In her blog The Science Dog, Linda P. Case recently wrote about fear and two research studies2 that examined how well owners and pet care professionals recognized and responded to signs of stress and fear in dogs. The first study indicated that over 90% of the people that participated could tell when a dog was happy; however, only 70% of dog professionals and 60% of dog owners could identify the fearful dogs. [bold emphasis mine]. That means a significant number of pet professionals and dog owners cannot tell when their dog is stressed or afraid. Clearly there needs to be more education in this arena. The late Dr. Sophia Yin, a veterinarian and animal behaviorist, made it her mission to educate other veterinarians, pet professionals and pet owners on how people can better understand and interact with pets so as to reduce stress for all concerned. Her seminars, DVDs, and book on low stress handling of pets have helped pet professionals make their practices “pet-friendly.” When professionals can identify fear and stress, and know how to respond accordingly, they can make efforts to minimize or eliminate it so that pets actually enjoy visiting and being handled. At the same time, the skills learned help staff become more competent in animal handling, resulting in improved safety for all parties and reduced costs. Pet professionals, pet owners and pets are all benefiting tremendously from these practices3. Many other veterinarians are also addressing this issue. Dr. Marty Becker is a veterinarian who is actively educating his colleagues on the importance of fear-free veterinary visits. In January, Dr. Becker presented on this topic at the North American Veterinary Community conference1, one of the largest continuing education events for veterinarians in the world. He talked about the Hippocratic Oath taken by veterinarians which emphasizes “First do no harm” and to “Cure sometimes. Treat often. Comfort always” [bold emphasis mine]. He discussed how the intense focus on medicine has caused veterinarians to sometimes neglect the parts about doing no harm. Dr. Becker continually underscores the value of making sure a patient is comfortable. The trend toward fear-free veterinary visits is rapidly growing. A Google search of the words “fear free veterinary visits” yields about 819,000 results. The website DVM360, a website for the veterinary community, lists 19 articles on the fear-free philosophy from April 1st through June 5th alone. With this trend, the move towards “Fear-Free” veterinary care is alive and well in Maine. 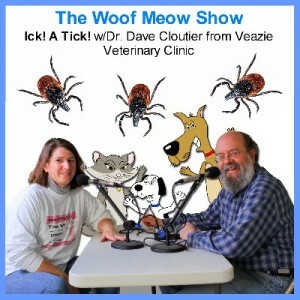 Kate and I recently invited Dr. David Cloutier, from the Veazie Veterinary Clinic4, to join us on The Woof Meow Show to discuss his clinic’s approach to fear-free veterinary care. Dr. Cloutier is clearly very passionate about this topic. He explained how it’s not only the best approach for the vet, the vet’s staff, the pet owner and the pet, but is also personally very rewarding. On our show with Dr. Cloutier we talked about dogs and cats and the fact that creating a fear-free visit for a cat is every bit as important as a fear-free exam for a dog however, because of a cats highly developed flight or fight instincts, doing so takes even more effort. Dr. Cloutier worries that if a cat owner has a bad experience taking their cat to the veterinarian that they may never go back to any veterinarian. This can result in very negative consequence for that cat’s health which is why making every visit a good one is so essential. Some of the things that Dr. Cloutier and his team at Veazie Veterinary are doing to make a pet’s visit fear-free include staff training on behavior, stress, and canine and feline body language, having separate waiting areas for dogs and cats, being patient and allowing pets time to settle, minimizing restraint as well as the number of people in the room with the animal during an exam and treatment, using high-value treats to reward calm behavior and to desensitize a pet to any perceived threats, using pheromones like Feliway with cats to help calm them, and teaching clients what they can do at home to help prepare their pets for a visit to the vet. It is essential for all pet care professionals to be following a pet friendly, fear-free philosophy if we are going to do well by your pets. If one of us causes a pet to have a fearful experience, due to the way the brain processes and remembers fear, that animal may now fear all of us. Lastly, we talked with Dr. Cloutier about the role of the pet owner in reducing stress. That role starts with learning about your pet and signs of stress and discomfort. Next it requires you to be an advocate for your pet and all of the people that participate in your pet’s care. You not only need to make sure that pet professionals that care for your pet follow a pet friendly philosophy, but you also want to make sure that family members and friends that care for your pet also follow your philosophy. Your pet cannot speak for themselves so please ask questions and speak on their behalf. They’ll be glad you did. Next month’s article will be focused on specific things you can do at home to help prepare your pet for a visit to your veterinarian, a boarding kennel, the groomer, or a training class. Links to the first two part of this series can be found below. Actively and wisely socializing a puppy between 8 and 16 weeks of age is as critical to a puppy’s behavioral health as vaccinations are to their physical health. Click here to listen to an eight minute podcast where Dr. David Cloutier and Don Hanson discuss this critical issue. I cannot stress enough the importance of socialization at this juncture in your puppy’s life. Dogs have a critical socialization period, which typically occurs between 8 and 16 weeks of age, allowing room for some individual variability. It is during this time that they will be most open to new and different experiences. What they are not exposed to during this time frame, they will be more likely to fear later in life. This does not mean that just because they were exposed to something they will never fear it, but it certainly decreases the chances of this occurring. A Puppy Headstart class alone is not adequate socialization for your puppy but is a great place to start. Having a credentialed instructor there to ensure sanitation and hygiene, to supervise puppy interactions and to answer student’s questions is invaluable. All puppies need to be safely exposed to as many different places, people, environments and situations as possible without over stimulating them. This is even more critical for the puppy that is unsure of himself, shy or fearful. It is even more important if you hope to have your puppy work as a certified therapy dog or as any type of service/assistance dog. Since your puppy will not be fully vaccinated when you start socializing them you do need to give some thought as to where you take them. A well-managed puppy kindergarten class or daycare, where they check vaccination records, supervise the puppies, choose appropriate playmates, and have established cleaning protocols represent safe choices. Places where the health status of animals is not regularly checked and large numbers of dogs congregate (i.e. dog parks) should be avoided. You have a short period of time to socialize your puppy; between 8 and 16 weeks of age, but rushing and not planning this process can be counterproductive. We recommend that you don’t just depend on socialization happening but that you plan and setup specific socialization events. You need to make sure that each event will be a positive and rewarding experience for your puppy. For example, if you are introducing your puppy to children for the first time, start with older children and with just one at a time. Then proceed to two at a time, then younger children, etc. The key is to go slow because if you overwhelm the puppy with too many people or too many new things at once, you may create a fear. The late Dr. Sophia Yin wanted to make sure that both dog people and non-dog people understand how to greet a dog and how not to greet a dog as well as to be able to recognize the signs of fear in a dog. These are things you need to understand before you start socializing your puppy. Dr. Yin developed two great handouts on this subject, which we provide in our classes or which you can download at the links below. When introducing your puppy to new situations, allow him to investigate and observe at his own pace. It is imperative that you watch him and gauge how he is feeling. If your puppy shows fear, take a mental snapshot of the situation so that you can devise a plan and work on it. Do NOT force a fearful puppy to confront its fears, as this will just make a bad situation worse. Your best option in this situation is to attempt to make light of what is occurring by having a happy voice and trying to jolly your pup a bit. When your dog relaxes, give a treat and leave. jumping and practice your sits. Make every place you go a positive experience and reward the puppy with a treat for each and every positive interaction. Places you can go: stores, sidewalks in front of shopping centers, parking lots, banks, post offices, the groomers and your veterinarian. While you will eventually want to expose your puppy to places like playgrounds and parades, you will need to do much work beforehand. Expose your puppy to different types and sizes of vehicles. Make sure they become familiar with well-behaved children as well as the elderly. Exposure to other types of animals such as cats and birds is also beneficial. Walking up and down stairs and on different types of surfaces is also part of the socialization process. Remember to address seasonal items. A puppy born in the summer will not normally be exposed to winter clothing, snow shovels, skis and other seasonal items during the critical socialization period. I know of a summer puppy that was terrified of people the first time he saw them all bundled up in winter coats. Likewise a puppy born in the winter may not have an opportunity to be exposed to swimming unless you devise a way to make that happen. In addition to taking your puppy places, consider having a puppy party. Invite a group of friends over to meet and help train your puppy. What better way to work on NOT jumping and sitting to meet a stranger. Just make sure everyone knows the rules beforehand. It is very useful to take your puppy to your veterinarian and groomer for some positive visits. Just stop in to say “hi” or to get weighed. Bring a treat along and have one or more of the staff treat your puppy. Next time they go to these places they will be happy to do so. Xena, a cocker spaniel puppy had her very first experience at the groomer’s when she was 9 weeks old. She had previously been to the facility two times to just meet the employees and to receive some tasty treats. At Xena’s first official grooming visit, she went in and stood on the grooming table, was combed a bit, had a bath and then she went home. One week later she returned and stood on the table again and had the clippers held up to her so that she could hear them “buzz”. After investigating the clippers they were placed on Xena’s back so that she could feel the vibration, and then she went home. The following week she returned once again and stood on the table and had her back and head clipped, as well as her feet trimmed, then she went home. The fourth week Xena was enthusiastic about coming into the groomer’s and was able to have her first complete grooming. By breaking up the process, this puppy never had the opportunity to become overwhelmed and frightened. That the groomer’s is not a scary place. That her guardian always returns for her. That being handled by a virtual stranger is an okay thing. To this day, Xena is a model groomer, who willingly stands on the table and is easily handled. She does not become at all stressed out when she is dropped off, rather Xena loves to come and be doted on. Gina, a 12-week-old Australian Shepherd puppy, a bit on the shy and timid side, was badly frightened when an adult male she had never met jumped out from behind a door and startled her. That people, men in particular, are very scary. To be wary of what may be lurking around doors. Since that episode, Gina has never had an interaction with a new person in which she has not behaved in a fearfully aggressive manner. However, she is perfectly comfortable with all of the people that she met prior to event. Gina’s owner will no need to do some additional work so that Gina does not have a life time fear of new people. sizes, vehicles, common objects, and different surfaces. The list is certainly not exhaustive. As you encounter an item that is on your treasure hunt list, check it off. Stacked Bags Of Sod, Mulch, etc. 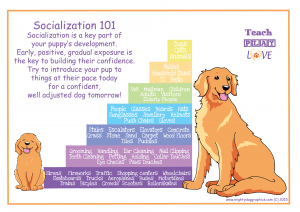 Our friends at Mighty Dog Graphics recently published and shared a graphic which illustrates some of the many things you need to include in your puppy’s socialization plan. You can download it by clicking here. 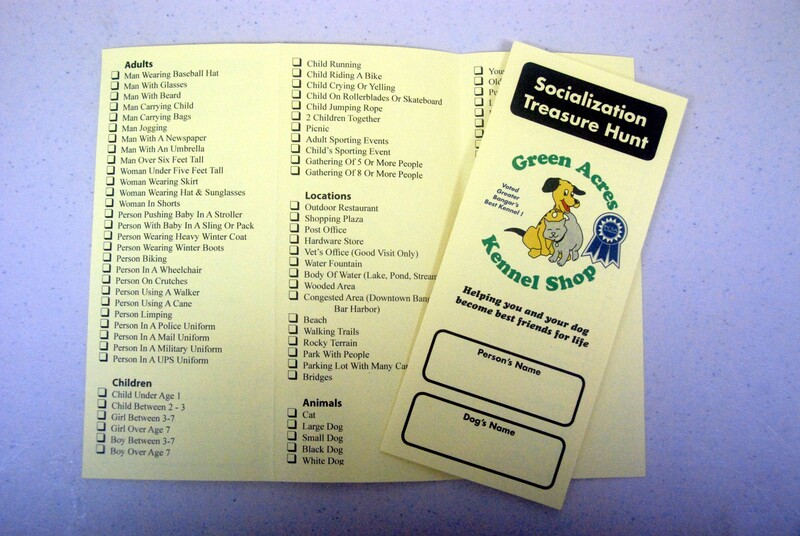 If you have questions on puppy socialization and habituation we encourage you to enroll in a Puppy Headstart class at Green Acres Kennel Shop. You can learn more about that by “clicking here” or by calling us at 945-6841. URGENT! 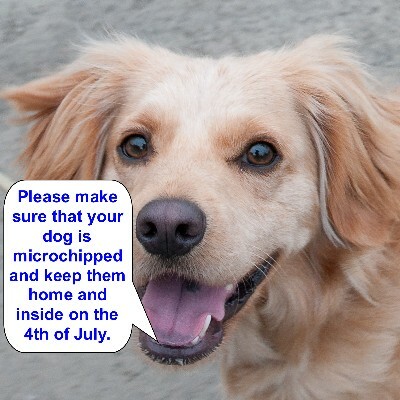 – Keep Your Pets Safe on the 4th of July-Act Today, Do NOT Delay! If your dog gets anxious and nervous at the sound of fireworks, start planning now on how you will keep them safe and how you will minimize their anxiety. If you live in an area where others set off fireworks, have a conversation with those people now. 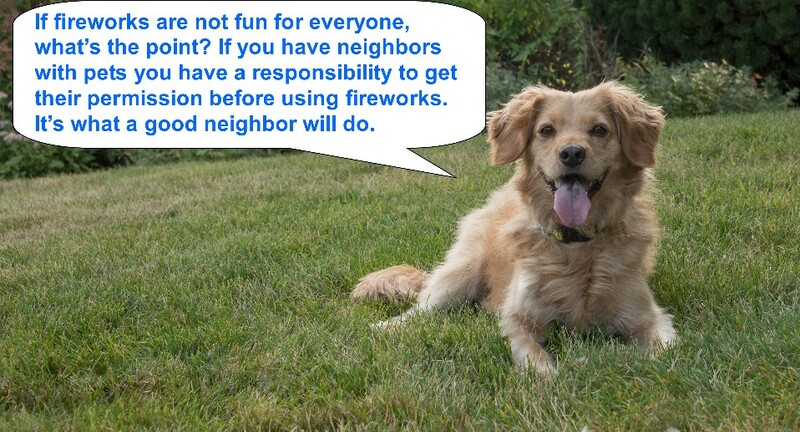 Politely explain how distressing fireworks are to your pets. Ask them to either refrain from using fireworks or to at least keep their use to a minimum, at times you are not home. If you cannot reach an agreement, make sure you have the phone number of the local authorities on speed dial and do not hesitate to make a complaint. Talk to your veterinarian about anti-anxiety medications you may use to help your pet. Over the counter products such as Bach Rescue Remedy, ComfortZone Dog Appeasing Pheromone, endocannabinoid based products specifically for pets and certain essential oils, such as Lavender, may also be helpful. 10 million pets get lost every year. This is more than the population of New York City. Of the dogs entering shelters, approximately 35% are adopted, 31% are euthanized and 26% are returned to their owner. Without proper ID or micro-chipping, 90% of lost pets never return home. A third of pets will get lost in their lifetime. An estimated 2 million pets are stolen each year. Keep your dog on leash unless they are inside or in a fenced yard. If you have guests in your home, make sure everyone is careful so as not to accidentally let the dog out. Do NOT take your dog to the fireworks. They are not going to enjoy the experience and may become frightened and run off. If you choose to use fireworks at your home or camp, or if you have neighbors that do so, make sure that your dog is inside, preferably in a room where they will not hear or see the fireworks. Please make sure that your dog is either micro-chipped or wearing a collar with a current, readable and legible ID tag. If your dog is micro-chipped, make sure that the chip registry has your current contact information. Keep a current photo of your pet that you can use on a “Lost Pet” poster if your pet goes missing. Make sure it’s a good photo that clearly shows any identifying characteristics of your dog. Maintain a list of phone numbers for your local animal control organization, police department, animal shelter(s), and pet related businesses so that you can notify them if your pet is lost and ask them to put up the “Lost Pet” poster that you create. If your dog is micro-chipped, contact the chip registry if they go missing. Many registries will help disseminate information about your missing dog on social media to aid in recovery. If you live in Maine, contact Maine Lost Dog Recovery via their Facebook page ( https://www.facebook.com/MaineLostDogRecovery ) as they can be very helpful in assisting you in getting the word out about your lost dog. If you are traveling with your pet, provide your pet with a temporary ID tag that provides local contact information for wherever you are staying. Walnut is one of the Bach Flower Remedies that I suggest everyone keep on hand in their first aid kit or medicine cabinet. It is a remedy I find myself recommending often as it is perfect for dealing with the many transitions we all face in today’s fast-paced world. Description from The Twelve Healers and Other Remedies, Edward Bach M.B., B.S., M.R.C.S., L.R.C.P., D.P.H. For those who have definite ideals and ambitions in life and are fulfilling them, but on rare occasions are tempted to be led away from their own ideas, aims and work by the enthusiasm, convictions or strong opinions of others. The remedy gives constancy and protection from outside influences. It is important to understand that Bach Flower Remedies are not a substitute for medical or veterinary treatment. Fill the treatment bottle ¼ full with cider vinegar, vegetable glycerin. brandy or vodka as a preservative. I usually use brandy or vegetable glycerin as I find that many animals do not like the taste of cider vinegar. 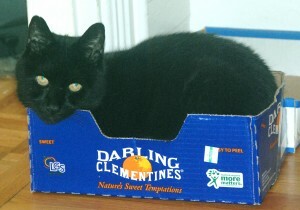 I usually use vegetable glycerin for cats, small animals and birds to further reduce the alcohol content. You may forgo the use of any preservative as long as you keep the treatment bottle refrigerated. Fill the remainder of the bottle with spring water. Put 2 drops of Walnut in the treatment bottle. You will treat your pet from this bottle. Place four (4) drops of the mixture from the treatment bottle on an absorbent treat, four (4) times per day. This does not need to be very six hours. I usually find that first thing the morning, just before leaving for work, when I come home from work, and just before bed, often works well. A small cube of bread or toast works very well for administering the remedies. In addition, you may put 10 drops of the prepared mixture, per gallon of water, in your pet’s water dish each time you fill it; however, this alone will not provide adequate dosage. When adding the remedies to your pet’s water supply, you should also provide them with non-treated water so that they have a choice, in case they find the water with the remedies objectionable. Continue to treat your pet in this manner until you see improvement. Dosage is the same for all size pets as well as for people. You cannot overdose on a flower remedy, but dosing more than necessary just wastes the essence. One of my clients was planning on getting a new puppy. She was flying across the country and asked if there would be a flower remedy that would be appropriate in helping her and the puppy make this journey. I naturally suggested Rescue Remedy, but also recommended Walnut because of the transitions both she and the puppy would be facing. The client and the puppy made it safely back to Maine without incident; however, a few days later I received a call concerning the client’s older dog. He was having a hard time adjusting to the new addition. Again I suggested Walnut and all adjusted well. What if Walnut does not help my pet? It is important to understand that Walnut is only one of 38 Bach Flower Remedies. It may not be the appropriate essence for your pet’s problem. If you have behavioral problems with your pet, you may want to consider making an appointment with Green Acres’ Director of Behavior Counseling and Training, Don Hanson, for a behavioral evaluation of your pet. Don is a Bach Foundation Registered Animal Practitioner (BFRAP), Certified Dog Behavior Consultant (CDBC) and Certified Professional Dog Trainer (CPDT-KA). He can work with you in developing a behavior modification program and in the selection of the most appropriate flower remedies for your pet. Rescue Remedy® is one of 38 flower remedies developed by Dr. Edward Bach in England in the 1930’s. Dr. Bach was a renowned British physician who felt a negative state of mind was at the core of many illnesses. His holistic approach to treating disease involved treating the body, mind and spirit. Treatment with flower remedies is especially appropriate for addressing stress related emotional imbalances. 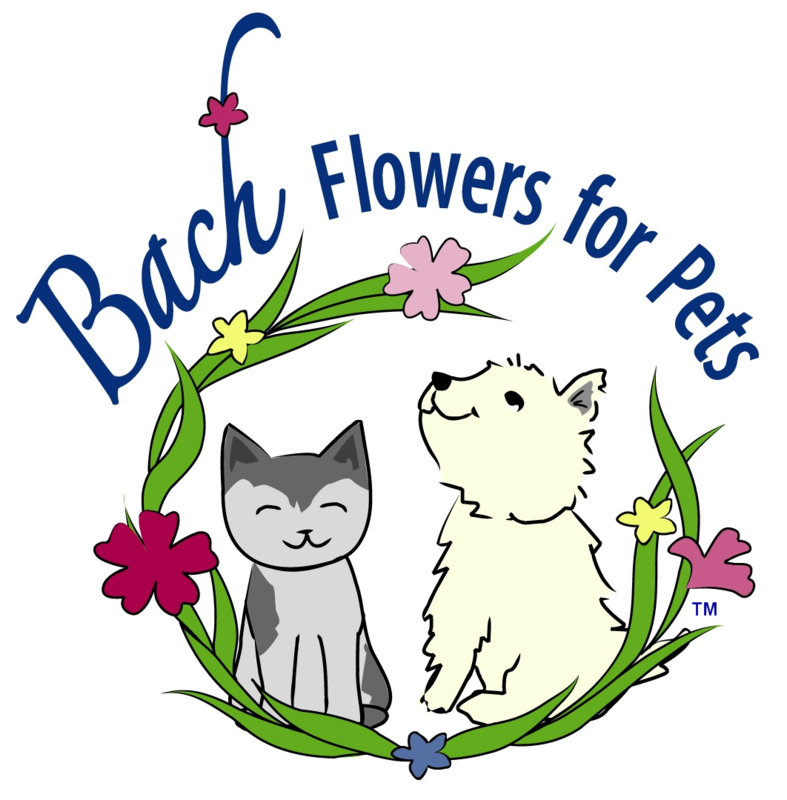 While the Bach Flower Remedies were originally developed for people, Dr. Bach also found them to be very helpful with animals. Rescue Remedy® is a combination flower remedy formula created specifically for addressing stress in emergency or crisis situations. The individual remedies used in this formula help with trauma and shock (Star of Bethlehem), terror and panic (Rock Rose), hysteria or loss of control (Cherry Plum), impatience and agitation (Impatiens), and faintness and stunned feelings (Clematis). This combination can help after an accident or in any situation that causes extreme anxiety, nervousness or even terror. Rescue Remedy® often has an immediate calming effect. It may be taken as often as needed without fear of overdosing: it is safe, gentle, and non-toxic. Rescue Remedy® is not a magic, instantaneous solution for long standing behavior problems. While it can be helpful in reducing the stress and anxiety of a timid dog, it will not make them into a gregarious, “gotta love everybody” dog. Nor will Rescue Remedy® remove your pet’s natural instincts, although it can help your pet to adapt those instincts to its environment. I have known Rescue Remedy® to be effective with pets suffering from fear aggression, separation anxiety, fear of thunderstorms and general anxiety. 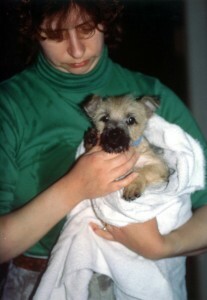 It also seemed effective in helping our Cairn Terrier recover more quickly after he had a seizure. Many veterinarians will routinely use Rescue Remedy® with pets before examination and surgery. Used topically or in its cream formula, Rescue Remedy® can also help alleviate hot spots and promote the healing of wounds. I cannot guarantee it will work for your dog or cat, but suggest that it is worth a try. Rescue Remedy® is available in 10ml and 20ml stock bottles for people or pets. Any of those products may be used with pets as can the 20ml spray bottle. Rescue cream can be used for external application. Do NOT use Rescue Pastilles with pets as they contain the artificial sweetener Xylitol which is toxic to pets. When dealing with sudden behavior changes, you should arrange for a complete medical evaluation by your veterinarian to rule out any physical or medical reasons for the behavior change before trying Rescue Remedy®. Physical injuries which cause pain are often a reason for sudden aggression and other changes in behavior. Do NOT try to treat your pet yourself if they are displaying any form of aggression, destructive behavior or any behavior that can cause significant damage to others, themselves, or property. These issues need to be addressed with your veterinarian and a qualified pet behavior consultant. Green Acres would be happy to assist you in finding someone qualified to help you. Do NOT use Rescue Pastilles with pets as they contain the artificial sweetener Xylitol which is toxic to pets. Fill the treatment bottle ¼ full with vegetable glycerin, brandy, or vodka as a preservative. Fill the remainder of the bottle with spring water, not tap water. 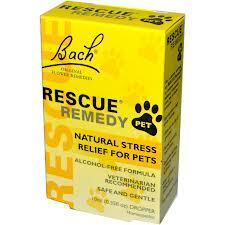 Put 4 drops of Bach Rescue Remedy® in the treatment bottle. You will treat your pet from this bottle. An acute situation might be a visit to the veterinarian or groomer, a thunderstorm, a car accident, a dog fight, or a seizure. It is something that happens suddenly which rapidly affects your pet. Place four (4) drops of the mixture from the treatment bottle on your finger and then touch your pet’s gums or tongue. Do not put the glass dropper anywhere near your pet’s mouth. Alternatively put 4 drops on a treat or small piece of bread and feed your pet. Lastly, you may apply the mixture to the paw pads, nose, belly, or ears. The remedy will be quickly absorbed from these areas. If you cannot get near enough to your pet to administer Rescue Remedy® in this fashion, you may use the treatment bottle solution in a mister bottle, and spray the area around your pet. Rescue Remedy® is also available in a spray bottle for this purpose. If you see no improvement in 20 minutes, administer an additional 4 drops. Rescue Remedy is typically used for acute, emergency situations. Most pets with a chronic condition should be seen for a behavior consultation so that a specific mixture of the 38 Bach flower remedies can be determined for their unique behavioral/emotional issues. A chronic condition might be separation issues, fear of strangers, fear of children, grieving for a lost companion, or adjusting to a new home. For chronic situations, you will typically administer 4 drops of Rescue Remedy, a minimum of four times per day. In addition, you may put 10 drops of the prepared mixture, per gallon of water, in your pet’s water dish each time you fill it. Continue to treat the pet in this manner until you see improvement. Dosage is the same for all size pets as well as for people. You cannot overdose on a Bach flower remedy, but dosing more than necessary just wastes the remedy. Place drops of the mixture directly on the area to be treated; it will be quickly absorbed. You may also wish to consider using Rescue Remedy® spray or Rescue™ Cream. Rescue™ Cream also contains the essence Crab Apple which is for cleansing. Pets I have seen helped with Rescue Remedy® include a dog in class that was afraid of other dogs and a dog exhibiting separation anxiety. The dog in our classes was so stressed around other dogs that all it wanted to do was bark while hiding behind its guardian. A dog that is experiencing that much stress is unable to learn. This dog was also disruptive to the other dogs in class. We gave the dog 4 drops of Rescue Remedy® on a biscuit, and within a couple of minutes the dog visibly calmed down and was able to remain in class. The guardian continued to give the dog Rescue Remedy® before every class and in other stressful situations and it did fine. The second dog was exhibiting minor destructive behavior whenever its guardians left it alone at home. They were looking for a quick solution, so I suggested they try giving the dog Rescue Remedy directly and also including it in the dog’s water bowl. Within two days the dog was able to remain at home alone with no problems. The guardians weaned the dog off the Rescue Remedy® over a two week period and today it stays home alone with no problems and with no Rescue Remedy®. I always reach for Rescue Remedy when I am experiencing a tension headache – the kind that starts at the base of the neck and works its way to the back of my head. My headache usually clears after I have taken 4 to 8 drops of Rescue Remedy. Applying Rescue Remedy Gel to the base of my neck also helps. Rescue Remedy cream is great for helping minor cuts and abrasions to heal faster. I have several friends who use it as a facial cream and find that it has dramatically helped their acne. Not all results are as dramatic as those described above and Rescue Remedy® might not be the best Bach flower remedy for your pet’s particular emotional issue. More chronic problems need to be treated over longer periods of time and some pets may require one of the other 38 flower remedies or some other combination of those same remedies. Many issues will also require a behavior modification program in conjunction with the use of flower remedies. What if Rescue Remedy® does not help my pet? It is important to understand that Rescue Remedy® is just one of 38 Bach Flower Remedies. It may not be the appropriate remedy for your pet’s problem. Sometimes when Rescue Remedy® works, it can reveal other issues. If you have behavioral problems with your pet, you may want to consider making an appointment with Green Acres’ Director of Behavior Counseling and Training, Don Hanson, for a behavioral evaluation of your pet. Don is a Certified Dog Behavior Consultant, Certified Professional Dog Trainer and is a Bach Foundation Registered Animal Practitioner. He can work with you in developing a behavior modification program and help to select the most appropriate Bach flower remedies for your pet’s issues. Practical Uses and Applications of the Bach Flower Emotional Remedies– Jessica Bear, Ph.D., N.D.
Like many people, I was initially very skeptical of complementary and alternative medicine and treatments such as Bach Flower Remedies. Having an engineering/science background, I found it difficult to deal with the concept that complementary medicine could not always be explained by science. It wasn’t until one day when I had one of those “a-ha!” moments that I discovered they might be a subject worthy of further study. My moment began with a client who had a dog with mild separation anxiety. Our discussion revealed 1) the dog was mildly destructive when left home alone; 2) the clients were concerned about the dogs emotional state but not what was being destroyed; 3) they were uncomfortable with the idea of using any drugs such as Clomicalm but were open to natural remedies; and 4) in my opinion the couple was unlikely to have the time or motivation to follow my standard behavior modification protocol. They were very busy and the problem was just not severe enough to cause them to take action. I wanted to help these people and their dog, but was uncertain how to proceed. Based upon their comments it was obvious that my normal treatment plan, Clomicalm from their veterinarian and a behavior modification protocol, was not going to be acceptable. I asked if they had heard of Bach Rescue Remedy®. I explained that I had limited knowledge of flower remedies, but that I had been looking for a natural, anti-anxiety treatment for one of our dogs, and had done a little research on this product and had heard of many people who had great success using Rescue Remedy®. I provided them with dosage guidelines, and sent them to the local health food store to buy a bottle (since this was before we sold the Bach Flower Remedies at our store). Approximately one week later my clients called and told me that after giving the dog Rescue Remedy® for a week, all separation problems had resolved! The clients indicated that they had made no changes in their routine, were not treating the dog with anything other than the Rescue Remedy® and had done no behavior modification. They reported that there dog was no longer showing any signs of stress when left alone and all destructive behavior had ceased. While this is only anecdotal evidence, it was enough to convince me that I needed to learn more about Bach Flower Remedies. Most of the information I will be presenting in this article is based upon anecdotal evidence. Because it is not based upon statistical research and the scientific method, anecdotal evidence is often dismissed by the scientific community, yet the following is a prime example of the role and importance that it plays. As early as the 1700’s, sailors were fed limes as a way of preventing scurvy. This practice was based strictly on anecdotal evidence. It wasn’t until 1932 and the discovery of vitamin C that the scientific method was able to prove why limes and other citrus fruits helped prevent and cure scurvy. Fortunately, no one stopped sailors from eating limes because scientists had not completed a study demonstrating that eating limes cures scurvy. Anecdotal evidence is often the first step in the discovery of new methods and ways of thinking. Bach Flower Remedies fall into the realm of complementary and alternative medicine along with Chinese medicine and acupuncture, herbal medicine, aromatherapy, homeopathy, and others. You will not find vast numbers of studies scientifically and statistically proving these modalities work, yet much of the world’s population, including many scientifically trained physicians and veterinarians, use these modalities with great success on a daily basis. While my engineering background initially caused me to be very close-minded about complementary medicine, I have seen first-hand, with myself, pets, friends, family and clients, how complementary modalities do heal. A few studies have been published on the use of Bach Flower Remedies with people. These studies concluded that they were effective in treating clinically depressed patients1, safe and effective when used with children for a variety of disorders2, and effective at reducing stress3,4. The Bach Flower Remedies are all natural, very dilute solutions made from spring water, an alcohol preservative, and the parts of specific flowers. They are used to help balance the emotions and bring about a state of equilibrium in living organisms, and have been successfully used with people, animals, and even plants. Bach Flower Remedies are listed in the Homeopathic Pharmacopoeia of the United States (HPUS), have been issued with National Drug Code (NDC) numbers by the Food and Drug Administration (FDA) and are sold as over-the-counter homeopathic products in the United States. Considering that Bach Flower Remedies can also be used to treat anxiety and do not have the side effects of Buspirone, I believe consideration of the Bach Flower Remedies would be a smart choice. There are a total of 38 different Bach Flower Remedies, 37 made from specific flowers and one made from the water of a spring believed to have healing properties. Each remedy is used to treat a specific emotion or state of mind such as fear, anger, apathy, etc. These are all emotions that most people can readily identify in themselves and in other people, and with training can also identify in animals. These emotional states and their corresponding remedy are all described in The Twelve Healers and Other Remedies by Edward Bach, MB, BS, MRCS, LRCP, DPH. Dr. Bach’s goal was to create a system of medicine that was simple enough that people who become familiar with the remedies through his publications could identify their negative emotional state, select the corresponding remedy and thus treat themselves. The Bach Flower Remedies may be used individually or in combination. Rescue Remedy® is the only combination remedy prepared and sold ready-made; it contains five remedies and is typically only used for emergencies or extremely stressful situations when the subject is in a state of mental or physical shock, terror, or panic. It should not be used as a replacement for veterinary care, but it is often used as a complement to traditional treatments. I know of many people who use Rescue Remedy® to calm themselves before trips to the dentist and who also use it with their pets before trips to the veterinarian. I always carry a bottle in my briefcase and car, so it is available in case of an emergency or accident. The Bach Flower Remedies are very safe. The only contra-indication is hypersensitivity to any of the ingredients. Since the botanical component is so dilute, a reaction is very unlikely. Grape alcohol is used as a preservative, so the essences may be unsuitable for those sensitive to alcohol. Bach Flower Remedies are not used to treat physical disease, but rather the emotional state of the patient. They can be used to help resolve fear and anxiety, anger, grief, and many other emotions. Common sense and numerous research studies5 have shown how stress can have a negative impact on the immune system. Anything that we do to reduce or relieve stress, including use of Bach Flower Remedies, has the potential to positively affect our immune system and thus aid in maintaining physical health. The Bach Flower Remedies were discovered by Dr. Edward Bach, a Welsh physician practicing medicine in the early 1900’s. Trained in conventional allopathic medicine, Dr. Bach observed that his patients’ recovery seemed to have as much to do with their emotional health as it did with any physical condition. Those in a positive emotional state recovered quicker. Dr. Bach’s area of expertise was bacteriology, but as he became more intrigued with the emotions of his patients, he started to study the work of Dr. Samuel Hahnemann, the founder of homeopathic medicine. Homeopathic medicine emphasizes treating the “whole” patient including their emotions and mental state, rather than focusing exclusively on physical symptoms. As a result of his research, Dr. Bach developed seven nosodes to treat intestinal disease. A nosode is a homeopathic remedy made from a pathological specimen. The Bach nosodes are made from bacteria found in the bowels. As Dr. Bach began to use the nosodes with his patients (which are still in use today) he observed that he could select the appropriate curative nosode for his patients based solely on their emotional state6. While Dr. Bach was very satisfied with the positive effects of homeopathy, he was concerned that many of the typical homeopathic remedies were made from toxic substances (bacteria, Belladonna, Mercury, Arsenic, etc.). He was convinced that if he were to devote his efforts to searching among the wonders of the natural world, he would find non-toxic medicines that would have a similar effect. In 1930 Dr. Bach left an extremely lucrative private practice in London and started on his quest to find what would become known as the Bach Flower Remedies. During the next six years he would discover and successfully use the same 38 essences that we use today. After my “a-ha!” experience I enrolled in the Dr. Edward Bach Foundation’s practitioner training program. (http://www.bachcentre.com/found/index.php) The foundation offers two training tracks; one for those who wish to use the remedies with people and one for those who wish to use them with animals. You must complete the first two levels of the human track before applying for the animal program. My level one and two human classes each involved two days of study in Boston, MA. These classes provided an in-depth review of each of the 38 essences and their use. The level two class also included case studies and an overview of counseling techniques. I completed my animal training at the Natural Animal Centre in the United Kingdom, the only place where the animal courses were offered at the time. This training involved a two -day, three-day, and four-day class and readings to complete at home in between sessions. (http://www.bachcentre.com/found/animal.htm) The classes covered the remedies as well as animal behavior and emotions, and counseling techniques. While we focused on canine, feline, and equine behavior we also studied turtles, rabbits, pigs, and other species. At the conclusion of the classes there is both an oral and written exam. Upon passing the exam, I had to successfully complete a series of case studies and a field study, before qualifying as a Bach Foundation Registered Animal Practitioner (BFRAP). I have taken additional continuing education on the use of the Bach Flower Remedies both in the UK and the US. Since completing my qualifications in December of 2003, I have been using the remedies with almost all of my behavioral clients. I have found them especially useful in treating many of the fears and phobias seen in pets. 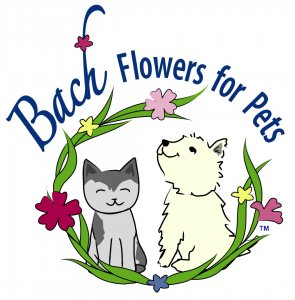 If a client’s veterinarian has recommended a prescription drug, I advise the client to continue to use that drug in conjunction with the Bach Flower Remedies. One of the nice things about the remedies is that they can be used with other treatments, including homeopathy, without interference. The most current information on our behavior consultation services can be found at: http://www.greenacreskennel.com/behavior-consultations. The Bach Foundation Code of Practice requires that I have a veterinary referral before recommending specific remedies and that I actually observe the animal’s behavior. When working with clients that are unable to bring their pet to my office in Maine, I review video of the pet’s behavior and work with the client, their local veterinarian, and a training or behavior specialist. At the conclusion of the consultation I provide the client with a behavior modification protocol as well as a combination of remedies for their pet’s specific emotional profile. I usually use both behavior modification and Bach Flower Remedies because it has been my experience that the use of the remedies can shorten the amount of time for a given behavior modification protocol. One of the biggest problems with behavior modification is getting the pet’s guardian to comply with the protocol. If the remedies shorten the amount of time required it’s a win-win for the guardian and the pet. In these cases I cannot prove the remedies helped resolve the issue; however, I have also treated some cases only with remedies and have seen dramatic results. I continue to have “a-ha!” moments with the remedies. For example, In 2005 I was treating a dog with severe resource guarding issues, some of the worst I have ever seen. Seven days after treatment with the remedies, and prior to beginning any behavior modification, the client sent me an e-mail noting “profound changes” in the dog’s behavior. I had them continue with the remedies and behavior modification due to the severity of previous incidents, but the dog has never again exhibited any guarding behavior and has become more engaged with her guardians. The behavior modification protocol we used involved safely identifying the items that were considered valued resources, managing the environment to prevent uncontrolled access to those items, and gradual desensitization to the loss of those items. While there is no scientific evidence to demonstrate that the Bach Flower Remedies caused this dramatic change in this dog’s behavior, if I look at the dog’s behavior, the remedies selected, and the short time in which the change occurred, I believe it makes a very strong anecdotal case for the use of Bach Flower Remedies. I do not have a set of standard combinations of remedies used for specific problems (e.g. separation anxiety, resource guarding, show dog formula, etc.) as each pet must be evaluated as an individual. Two dogs, each with separation anxiety, may be treated with entirely different combinations of remedies. I remain in contact with the client and meet with them as the situation requires. At times I treat both pet and guardian, as often the pet is feeding off the guardian’s emotions. In almost all cases, the problem is treated as a chronic problem rather than an acute issue or passing mood. For chronic behavior problems, remedies should be administered at least four times per day7, 8. The Bach Flower Remedies are not the proverbial “magic bullet.” While the two cases I have summarized showed dramatic improvement within a week, treatment typically takes longer. Depending on the issue being treated, the length of time the problem has existed, and the clients compliance, issues may start to resolve in anywhere from two weeks to a year. I have found the remedies typically help to accelerate the behavior modification process and therefore help improve client compliance. If clients start to see results, they are more likely to continue with the behavior modification protocol and the administration of recommended remedies. Bach Rescue Remedy®, the most well-known of the Bach Flower Remedies, is a combination flower remedy formula created specifically for addressing stress in emergency or crisis situations. The remedies used in this formula help with trauma and shock (Star of Bethlehem), terror and panic (Rock Rose), hysteria or loss of control (Cherry Plum), impatience and agitation (Impatiens), and faintness and stunned feelings (Clematis). It is usually only used for acute or emergency situations, but can be used for treating chronic conditions, when appropriate. It can help after an accident or in any situation that causes extreme anxiety, nervousness or terror. Rescue Remedy® often has an immediate calming effect, and is safe, gentle, and non-toxic. It may be taken as often as needed without fear of overdosing. Rescue Remedy® is not, however, a magic, instantaneous solution for long standing behavioral problems. While it can be helpful in reducing the stress and anxiety of a timid animal, it will not make them into a gregarious, “I love everybody” dog. Nor will Rescue Remedy® remove your pet’s natural instincts, although it can help your pet to adapt those instincts to its environment. Fill the treatment bottle ¼ full with vegetable glycerin, brandy, or vodka to act as a preservative. If you chose not to use a preservative, you must refrigerate the treatment bottle. Fill the remainder of the bottle with spring water (do not use not tap water). Dr. Bach specified spring water because he felt it was natural, unlike tap water which can be loaded with chemicals. 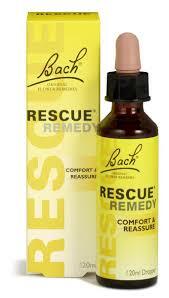 Put four drops of Bach Rescue Remedy® in the treatment bottle. You will treat your pet from this bottle. An acute situation might be a visit to the veterinarian or groomer, a thunderstorm, a dog fight, or a seizure. It is something that happens suddenly and rapidly affects your pet’s emotional state. Place four drops of the mixture from the treatment bottle on your pet’s gums or tongue or on a treat or small piece of bread. Alternatively, you may apply the mixture to the paw pads, nose, belly, or ears. The remedy will be quickly absorbed from these areas. If you see no improvement in 20 minutes, administer an additional four drops. 1Masi, MP. (2003) BFE treatment of chronic major depressive disorder, Alternative Therapies in Health and Medicine, Vol. 9 No. 6. 2Campanini, M. (1997) Italian medical study of 115 patients, La Medicine Biologica; Anno XV, n.2, Aprile-Guigno. 3 Cram, J. (2001). Two double-blind scientific studies of flower essences and stress. Flower Essence Society, www.flowersociety.org. 4 Walach, H. & Rilling, C. (2001). Efficacy of Bach-flower remedies in test anxiety: A double-blind, placebo-controlled, randomized trial with partial crossover. Journal of Anxiety Disorders UK. 15(4) July-August. 5Segerstrom, SC & Miller, GE (2004). Psychological stress and the human immune system: A meta-analytic study of 30 years of inquiry. Psychological Bulletin, 130, 4. 6Howard, J. & Ramsell, J. (1990) The Original Writings of Edward Bach. The C. W. Daniel Company, Ltd., England. 7Bach E. (1933) The Twelve Healers and Other Remedies. The C. W. Daniel Company, Ltd., England. 8Product Information and Usage Guidance Sheet, Nelson Bach USA Ltd., Wilmington, MA. http://www.nelsonsnaturalworld.com/en-us/us/our-brands/bachoriginalflowerremedies/about-the-remedies/faqs. CONCERNED ABOUT CANINE FLU? DO NOT MISS THIS SHOW! 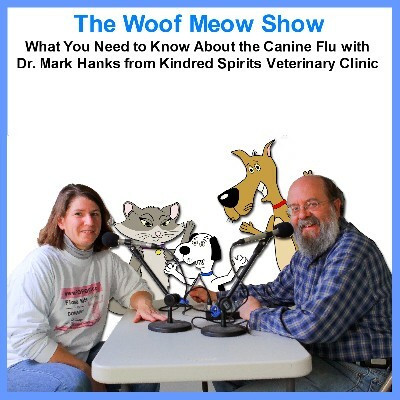 The canine flu has been all over the news and even though it has not been seen in Maine this year, we asked Dr. Hanks to talk to us about canine flu. Topics addressed; what differentiates the flu from other respiratory disorders we see in dogs, how does the canine flu seen in the Midwest differ from the canine flu seen in 2002/2004, what are the symptoms, how should the flu be treated, when should dogs be vaccinated, what tests are available, should we be worried about people bringing dogs in to Maine from other states, and how serious is this? This show first aired on The Woof Meow Show on The Voice of Maine on Saturday June 20th on 103.9FM, 101.3FM and 1450AM. It and other shows are available for download at the Apple iTunes store, at our podcast host; http://woofmeowshow.libsyn.com and at our website www.woofmeowshow.com. It was in the September of 2002 that the first version of this article appeared in Paw Prints, the Green Acres Kennel Shop newsletter. I update the article on a regular basis because sadly there are still too many people, some of them animal professionals, and some who try to play the part on TV, promulgating the dominance myth. Unfortunately a popular reality TV show has captured people’s attention and is talking about dogs as pack animals and again perpetuating the idea of using “calm-assertive energy” (read: fear and intimidation) to resolve issues with problem dogs. Like most “reality” TV shows there is very little that is real here. The methods and approach used on this show are contraindicated by science and behavioral experts and many consider them inhumane. Unfortunately, many viewers do not seem to understand that the show is edited but instead believe “miracles happen in 30 minutes.” Even though each show contains a disclaimer; “please do not attempt any of these techniques on your own, consult with a professional,” people do try these techniques at home and cause further harm to dogs that are already suffering. As result the two largest organizations of professionals that deal with animal behavior; the American Veterinary Society of Animal Behavior (AVSAB) and the Association of Pet Dog Trainers (APDT) have issued official positions warning against the use of the dominance approach in training or dealing with behavioral issues with dogs. In 2010 Green Acres elected to do the same in an effort to educate dog lovers about our position on this topic. That position statement can be found on our blog at http://bit.ly/GAKS-Pos-NoPain-NoForceNoFear. Never let your dog pull on leash. Essentially you were advised to be ever vigilant and to show your dog that you were the boss in order to prevent him from taking over your home and becoming disobedient and even possibly aggressive. The concept of the dominant dog was based on an experimental model of how wolves interact socially within a group. The wolves being studied were described as having a strict, force-based hierarchical structure where one male and one female were always the dominant ones, also known as the alpha pair. These dominant wolves had first access to the resources necessary for survival: food, water, and a mate, and fought to maintain these resources. The other wolves in the pack were constantly challenging the alphas so that they could take their positions and have first access to the resources. Someone then extrapolated that since wolves and dogs are biologically the same species, dogs must also be struggling for dominance amongst each other and with us. This myth that dogs were striving to be the alphas over us led to the philosophy that we must always maintain dominance over our dogs and that the best way to do that is to use physical and mental intimidation, just like the captive wolves used with each other. This philosophy was pushed in a popular book of the 1970’s, How to Be Your Dog’s Best Friend, by the Monks of New Skete. The Monks included detailed instructions for physically disciplining your dog. They recommended hitting your dog hard enough under the chin so that it hurts and shaking the dog by the scruff of their neck while yelling at them. The Monks described something they called the alpha wolf rollover as the ultimate punishment for the most severe disobedience. This involves grabbing the dog by the scruff of their neck, and firmly and rapidly rolling the dog on its back and pinning it while making eye contact and yelling at the dog. In their book the Monks asserted that these disciplinary techniques are what a mother wolf would use in the wild to discipline her pups. The fact is the Monks had no idea what they were talking about, and some of them have since recanted this particular method of punishment, as the “alpha wolf rollover” does not happen with wolves. The Monks of New Skete were not alone in their flawed understanding of canine behavior. The concept of dominance and putting the dog in its place was, and in some cases still is, very pervasive in the field of dog training. My first personal experience with the alpha wolf rollover occurred in 1991 at the very first dog training class that I attended. Based on the recommendation of our veterinarian, Paula and I were taking our 12 week old Cairn Terrier puppy, Gus, to an obedience class. It was the first night of class and all of the puppies were expected to sit on command. When Gus would not sit, the instructor told me I had to show him who was boss and make him sit, and if he still wouldn’t do it, then I should alpha roll him. Well Gus wouldn’t sit (I know now he had no clue what I was even asking for) and so I was told to “alpha roll him!” I soon had a terrified (unknown to or disregarded by everyone) puppy, flat on his back, pinned to the floor, eyes rolling, body writhing, mouth growling and snapping at everything. The instructor was really adamant now: “We can’t have that! Grab his muzzle and clamp it shut!” My instincts said “Whoa! That’s not safe!” but these people were the “experts” so I grabbed Gus’ muzzle in my hand. Instantly, I felt his canines puncture my palm. As my blood started dripping on the floor, Gus broke free and moved as far away from me as he could. There is something to be said for listening to your gut instincts. Gus listened to his; I failed to listen to mine. Unbeknownst to me at the time, everything that I had read and been taught about the alpha wolf rollover was based upon flawed knowledge. My puppy was afraid for his life and it was my fault. Dangerous and a great way to give your dog a good reason to bite you. Damaging to the relationship between pet parent and dog. It teaches them to mistrust you. A great way to make a good dog aggressive – aggression by the pet parent will result in escalated aggression by the dog. As for Gus and me, I do not really remember much of what happened next other than being offered ice for my hand as Paula worked with Gus for the remainder of the class. In fact, Gus and I were rather wary of each other for quite some time and I let Paula take him to the rest of his classes for the next year. Over time and lots of games of tennis ball, Gus and I learned to trust one another again and started having fun. As I started to learn more about dogs I discovered that there were far better ways to train a dog than with fear and intimidation and trying to be dominant. The wolves being studied that resulted in the conception of the dominance construct were not a pack of wolves living in the wild but were in fact a mixed non-familial group of wolves living in a fenced enclosure, some as small as 5 acres, with far less resources than what would be available in the wild. This was not a normal family of wolves nor were these wolves in a typical environment. They were forced to live under extremely stressful and unnatural conditions. Is it any wonder they became aggressive? Even when feral, dogs do not have a pack structure. Unrealistic expectations – Many people expect dogs to be furry little people with human values and morals. They do not like that dogs exhibit normal canine behaviors such as mounting, sniffing butts, and jumping up on people, just to name a few. Some of the behaviors we find undesirable are perfectly normal for dogs. Not accepting these actions as being normal canine behaviors is simply unrealistic. However, if we find something such as mounting undesirable, we can easily teach our dog “sit” or “leave it.” This gives the dog something else to do that is mutually exclusive to mounting. For some illogical reason people expect a dog to always comply with every command they give. How many people do you do know that always do everything they are told to do? Failure to manage the dog and its environment – Dogs are scavengers and are always looking for food. If your dog steals a steak off the countertop it is not because they are trying to become dominant, it is because steaks taste great to them and we left the dog and the steak in a situation where this could happen. We need to take advantage of the fact that we are smarter than the dog and be responsible by managing the environment so that the dog cannot behave inappropriately. If a dog is successful in a behavior, it will be repeated, not because it is dominant but because it has learned the behavior is rewarding. Failure to train the dog – Too few people take the time to successfully complete at least one training class with their dog, or follow through with an adequate level of training at home. These dogs are then presumed to “know better” when in reality they are being expected to do calculus when they have only been taught basic addition. Often these dogs are then labeled “dominant”. Every dog needs to be trained and needs to be trained for life. The best way to train any animal, dog or human, is by rewarding the dog for behaviors we like. Fear of their guardian – Physical punishment and even lots of yelling are going to cause your dog to fear you. When a dog is afraid it will try to done of two things, run away or fight. 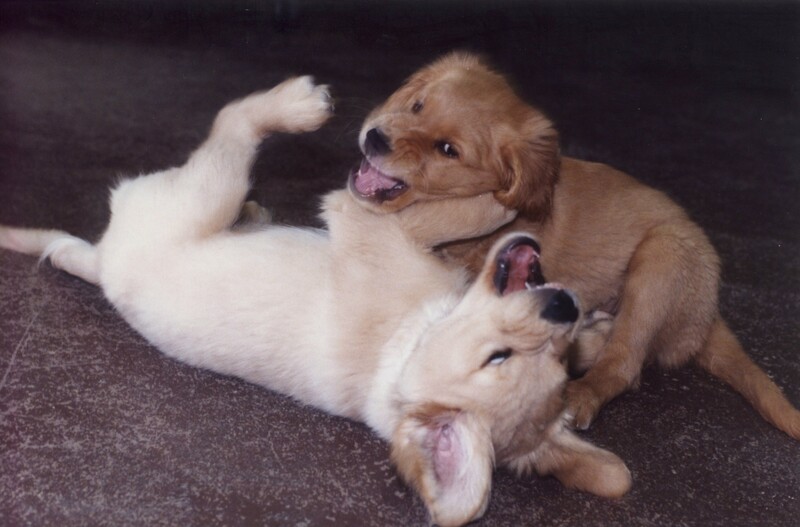 Fighting often involves biting. Allowing the dog to train you – A lot of “dominance” issues involve dogs that have essentially become spoiled brats. Dogs do what works, and if they find they can stay on the couch by growling or get attention by pawing at you, then that is what they are going to do. These dogs are not dominant; they have quite simply done a very effective job of training you, instead of you training them. Physical Punishment – Choosing to train with physical punishment is more likely to result in “dominant” like behaviors such as growling and snapping, because it puts the dog in a position of fearing for its safety. Tools such as shock collars and choke collars are designed to cause the dog fear and pain. When a dog is afraid or feels pain he will respond accordingly. Rather than rewarding desirable behaviors, punishment for undesirable behaviors creates a dog that is always on the defensive and afraid that making the wrong choice will cause pain. Failure to meet the dog’s needs – While not really associated with dominance, a common reason for undesirable behaviors in dogs is our failure to meet our dogs’ needs for physical exercise and mental stimulation. Stealing a sock or underwear is a great way for the dog to get the attention he wants and needs. To a dog, it can be very rewarding to be chased and yelled at, especially if this is the only exercise or play their guardian provides. Emotional issues – In my experience most aggressive behavior by dogs is not due to “dominance” but is due to an emotional reaction, fear and anger being the most typical. A dog that is afraid is a dog under stress and like a person under stress can react very irrationally, and if they feel threatened very forcefully. Sadly there are still trainers that tell people to punish their dogs for growling or advise them to force the dog into a sit-stay and allow people to pet it until the dog becomes comfortable. This would be akin to taking a person afraid of snakes and tying them in a chair and allowing snakes to crawl all over them. This approach is certainly not humane and is more likely to make the fear worse. Dogs with emotional issues can be helped, but a training class is usually not the answer. An individual behavior consultation would be our recommendation in this situation. Strive to be good guardians and provide your dogs with everything they need, including food, water, shelter, training, mental stimulation, physical exercise and common sense management. This way they will not learn the undesirable behaviors that in the past have been erroneously attributed to dominance. IF YOU ARE CONCERNED ABOUT TICKS – DO NOT MISS THIS SHOW. Every year Kate and Don always talk with Dr. Cloutier about fleas, worms and ticks. This year we’re talking all about ticks because it’s such a hot topic with our clients at Green Acres. Dr. Cloutier discusses; ticks and when we’re most likely to see them, micro environments/habitats where ticks often thrive (some places are much worse than others), how ticks get on us and our pets, how to control tick habitat in our yards, how to keep our dogs away from ticks when hiking, how to check your pet for ticks, how to safely remove ticks, what products should we use to help keep ticks away and which should we avoid, how do we balance effectiveness with safety, how do we choose a product when we have both dogs and cats in our home (some products for dogs are fatal for cats! ), and the importance of talking to your vet about any flea and tick products you use with your pet. This show first aired on The Woof Meow Show on The Voice of Maine on Saturday June 13th on 103.9FM, 101.3FM and 1450AM. It and other shows are available for download at the Apple iTunes store, at our podcast host; http://woofmeowshow.libsyn.com and at our website www.woofmeowshow.com. Our cat Tyler enjoying some time alone in a bag. 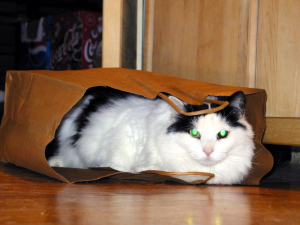 The following article by Dr. Karen Becker discusses cats’ fascination with boxes, bags, and other small spaces and explains how these simple things can help alleviate a cat’s stress. A cat’s standard response to most stressful situations is to withdraw and hide, provided that is an option. By providing shelter cats with boxes as a hiding place, a team of researchers learned that those shelter cats acclimated faster to the shelter environment. 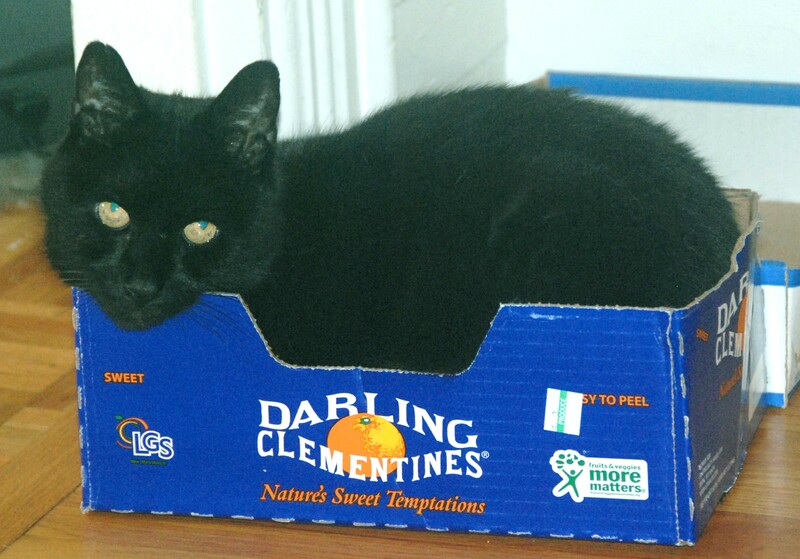 Using boxes to relieve a cat’s stress isn’t just for shelters. Consider doing the same at home if you cat is feeling a bit wary about something in their environment.